A Furnace or Boiler that is not running a peak performance can be deadly. Carbon Monoxide is a natural product of incomplete combustion. A clean, efficiently burning system produces very small amounts of carbon Monoxide, while a dirty, inefficiently burning system can produce deadly amounts. It is highly recommended to have your heating system cleaned and inspected every year. Replace or clean your furnace filters at least three to four times a year. 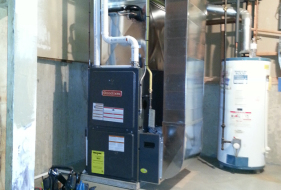 A new filter makes your furnace more energy efficient and saves money too. If you’re looking for a worry free maintenance program well look no further. We offer a flexible maintained program for all of your mechanical equipment. Simply choose what equipment you would like to include in your agreement then leave the remembering to us. We will call to set up a suitable time to service your equipment. Remember, having your equipment serviced on a regular basis can prevent costly repairs.